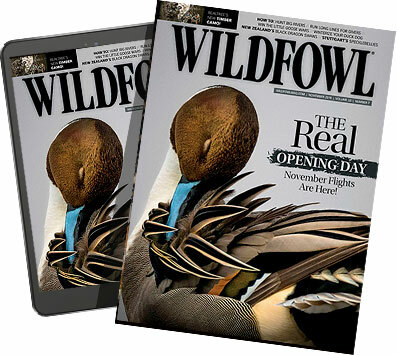 Quick-winged Wood ducks come incidentally to most hunters, but they're a prize worth pursuing. It was around 1957, and I was a shirttail kid tagging along with my father on an Arkansas flooded-timber duck hunt. Two autumn-colored creatures, drake and hen, came zipping through a sort of accidental corridor in the forest deep within the flooded White River bottoms, their afterburners lit and the hen's woo-e-ee-eeeek siren going full blast. They passed 15 yards overhead as Dad and I were wading through the woods, headed for some hotspot duck hole he knew about. Dad saw them first, punched me on the arm and pointed. I looked up just in time to see them flash through a patch of golden, early-morning sunlight. They spied our upturned white faces and flared out through the treetops, framed for an instant against a sky so blue it made your eyes hurt. I'm sure Dad had time to shoot; green-timber duck hunters are often forced to shoot by instinct, and my father was an experienced green-timber hunter as well as an athlete with lightning-quick reflexes and excellent hand-eye coordination. But he just stood and watched them with me, his shotgun still held comfortably over his shoulder. "Why didn't you shoot?" I asked, after they were gone. "They were wood ducks," he said. "There aren't many of them around any more, and the season's closed on 'em. They're almost too pretty to shoot, anyway." I don't remember how many mallards we shot that day, but more than four decades between then and now have failed to dull my memory of that moment. Those two wood ducks are long gone, but in my mind's eye they'll last as long as I do, framed against that morning's cobalt sky and flashing their colors like the flag team in a high-school homecoming parade. When Dad and I crossed paths with the high-flying wood ducks, their numbers had already experienced some serious ups and downs. Things hadn't gone as badly for the wood duck as some other species of birds, but they were in a serious slump nonetheless. Those two birds we saw that day were definitely survivors. Before the Migratory Bird Treaty Act in 1918, duck seasons were liberal and long--usually from September to April, with either nonexistent bag limits or limits so large it took two men to carry one hunter's birds. Limits were meaningless, anyway, since game law enforcement was practically nonexistent and market hunting was common. In my home state of Arkansas, for example, there were only nine game wardens in the early days. The fledgling Arkansas Game & Fish Commission, established in 1915, had almost no operating capital, and the nine wardens were poorly equipped and even more poorly financed. They even had to use their own vehicles, with no plan for reimbursement. In other states, wildlife agencies were in similar financial straits. Since wood ducks are more southerly oriented than most ducks, they took a harder hit than most from those long, liberal, poorly enforced hunting seasons. They were hunted all summer in the Midwest and the North, and year-round in the South. By 1900, it was evident the species was in trouble. Many early conservationists believed woodies were headed for extinction. Noted ornithologist George Bird Grinnell wrote of wood ducks in 1901, "Being shot at all seasons of the year they are becoming very scarce and are likely to be exterminated before long." The woodies, though, had other ideas. Their numbers continued to dwindle until 1918, but they somehow managed to hang on. And then, under the full protection of the law and the beginnings of the conservation movement and the birth of scientific wildlife management, wood ducks began a long, slow recovery. The species took another downturn during the prolonged drought of the 1950s--as did all duck species--but quickly recovered when conditions improved. Since the mid-1960s, wood ducks have ranked second or third in annual harvest totals in both the Atlantic and Mississippi Flyways. Wood ducks, as their name implies, are birds of the forest. They seldom leave the shelter of the woods, and this explains why they're primarily found in the eastern half of the nation. There's a West Coast population, but it's very small compared to the population in the East. These colorful ducks nest in hollow trees, but readily accept man-made nest boxes when they're properly built and properly located. Although they prefer to be closer, wood ducks will nest up to a mile from water if they have to go that far to find a suitable nest cavity. Another peculiarity of wood duck nesting behavior is the common practice of "dump" nesting--two or more hens depositing their eggs in the same nest. One researcher recorded five different hens contributing eggs to a single nest. This sometimes results in an exorbitant clutch size, 40 or more eggs. On rare occasions, two hens will share incubation duties of these oversized clutches, but a single hen usually does all the work. In up to 10 percent of dump nests, there is no incubation at all. At least one Mississippi study found--not altogether illogically--that dump nesting increased when wood duck numbers increased within the study area. No one has ever proven the reason for this odd behavior. Some biologists think dump nesting results from a shortage of suitable nest cavities, although dump nests are sometimes located in artificial nest boxes in woods that are loaded with them. Maybe, other researchers suggest, dump nesting is an aberrant behavior triggered by growing population pressures as wood duck densities increase. Then again, that might not be the case. Other studies have shown that most hens contributing eggs to dump nests also lay their own clutches in other nest cavities and incubate them. Wood ducks nest earlier than most other ducks--again, not an entirely eye-popping revelation, considering the more southerly nesting range of woodies compared to mallard, pintails, teal and their other puddle-duck cousins. However, we're talking really early here. Sticking with the Arkansas example, wood duck nesting activity begins in early February and continues into late June, with the peak nest initiation period in mid- to late March. Adult birds tend to nest earlier than yearlings entering their first breeding season. so much because they destroy the eggs, but because they take over the nesting cavity or box and harass the hen wood duck until she abandons ship. The long nesting season (120 to 130 days in Arkansas and other southern states) allows wood ducks to re-nest after one clutch is destroyed. Thus, wood ducks are able to maintain a high percentage of productivity in most years. A woodie hen usually begins laying a second clutch of eggs within two weeks of losing the first. Some hens re-nest even after bringing off a successful first clutch, thus contributing two broods to a single year's production. During a two-year study on Big Lake National Wildlife Refuge in northeast Arkansas, researchers found that at least 27 wood duck hens brought off two clutches during the study period, and ducklings from at least 16 of the 27 first clutches survived to flight stage. Although the drake wood duck doesn't share incubation duty, some pairs stay together until the end of the 28- to 37-day incubation period. The male then leaves, and the hen rears the brood solo. Drakes spend the summer months alone or in small bachelor groups. During the eclipse, or summer molt, adults are flightless. This happens to both drakes and hens, of course, but being ground-bound makes little difference in the life of a nesting or brood-rearing hen wood duck; she's not going to be doing a lot of flying, anyway. The temporarily drab and flightless drake seeks dense cover during this three-week period of vulnerability, and it's during this brief time of summer when the wood duck population seems to evaporate. When autumn comes and the annual migration begins, wood ducks join in. But while the rest of the puddle ducks have a long flight ahead of them, many wood ducks are already in the southern states. Wood ducks tend to migrate in hopscotch fashion. Birds that summered in Louisiana and Arkansas pretty much stay where they are. Birds from Missouri drop down to Arkansas and Louisiana. Birds from Iowa drift south to Missouri, and birds from Michigan, Wisconsin and Minnesota drop down to Iowa. As winter progresses, the northernmost ducks continue moving south, until by January more than 90 percent of the continental population of wood ducks is south of a line drawn through Little Rock, Memphis and Nashville. Therefore, to hunt wood ducks where populations are highest, you must wait until the tag end of duck season and head for the Deep South. Fortunately, hunters don't have to do that to enjoy good wood duck hunting. In fact, the best time to hunt woodies is in the early part of the season in most states, going after resident birds or transient migrants. Big flights of mallards may still be a state or two to the north when duck season opens, but the woodies will almost certainly be there. Although there are dozens of brands of wood duck calls on the market, they're better at luring hunters than luring wood ducks. Woodies seldom respond to a call when they're on the wing. And decoys aren't all that effective either, because woodies fly so fast and through such heavy forest cover that they rarely see decoys in time to react to them. Pass shooting is the best way to hunt wood ducks, and for this, it's best to hunt with a partner. The first and most important rule: get there early. Woodies fly best at first light, and the legal 30 minutes of shooting time before sunrise is going to provide you with 90 percent of your opportunity for the day. In flooded woods, find an opening where a tree has fallen and left a hole in the canopy. Stand in the middle of it with your hunting partner, facing in opposite directions. Be ready; they come fast. If you don't have flooded woods handy or don't want to hunt there, wooded creeks, bayous, sloughs and small rivers serve as flyways for wood ducks, and by stationing yourself at a good opening along the bank of one of these waterways, you can have that same hot 20 to 30 minutes of pre-sunrise action. In most cases, it's best to hunt from a boat tied to a tree or brush well away from the bank. Not only does this provide better visibility, but also you can use the boat to retrieve downed birds easier if you don't have a dog. Wear camo clothing and cover any bright objects in the boat (outboard motor, gas can) with camo cloth, burlap or vegetation, and sit still until it is time to shoot. Floating and jump-shooting wood ducks from a canoe or johnboat is also an effective wood duck technique on small, brushy streams, and unlike pass shooting, jump-shooting can provide action at any time of day. On small, twisting streams you can sometimes get by without using any type of camouflage on the boat, but in many cases it's a good idea to rig a camo screen or pile some leafy brush on the front of the boat, to allow for a closer approach to floating ducks. One person paddles while the other sits in the bow with shotgun ready for action. Wood ducks almost invariably shriek their warning call when they flush, giving the shooter time to at least raise his gun before they're out of range. It's illegal to shoot from a boat that's being propelled by a gasoline or electric motor, though, so you must paddle while hunting. That's why a canoe is better suited for this activity. One final productive technique is waiting at the tag end of the day near a roosting area and taking wood ducks as they funnel in for the night. Wood ducks often congregate in roosting flocks of up to several thousand birds in some wooded sloughs in the South, and a hunt here can provide fast action without causing any harm to the roost. The problem is, unless it's a cloudy day, most of the birds won't come in until after legal shooting hours, so be sure to keep a close eye on your watch. However you do it, hunting wood ducks is worth the effort. It's a notable thing to be able to legally hunt a species that was once considered on the brink of extinction. Especially when it's a bird as beautiful as a fully feathered drake wood duck. Between the day Dad and I saw that first pair of woodies and the end of his hunting career in 1990, he and I shared many flooded-timber duck hunts. After they once again became legal game about 1960, we bagged more than a few of them, sometimes as incidentals on mallard hunts and sometimes because we were specifically hunting for woodies. And every single time my Dad ever killed a wood duck in my presence, he'd smooth its feathers and hold it up for my inspection, angling it so the sunlight would catch it just right. "Remember that day?" he'd ask, stroking the feathers of a bird the color of autumn.